Google just made the world a slightly smaller place today. 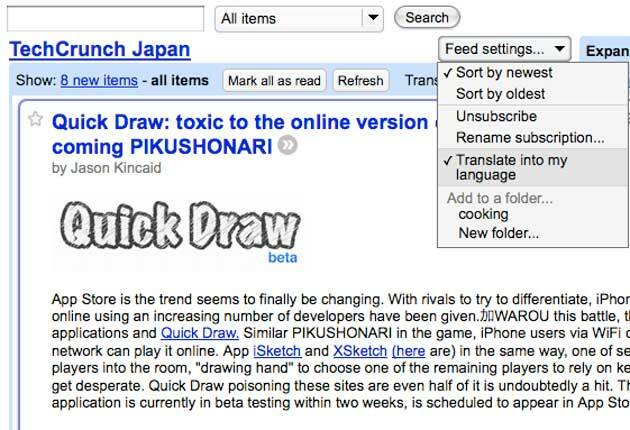 They’ve added a feature to their highly popular Google Reader that will auto-translate any site with a feed to your native tongue. Not only that, it’s very easy to use and it works really well. Just subscribe to a blog or other feed like normal, then pull down the feed settings menu on the right and choose “Translate into my language.” The text is instantly translated. We tested it with TechCrunch Japan, and the translations came through well enough to understand. Definite winner. Tell us your favorite foreign language tech blogs in the comments so we can subscribe immediately!